"I'll remember this for the rest of my life. Being able to win in my last race as a collegian, and to do it in a Duck uniform at Hayward Field, it's just magical. I couldn't have been blessed with a more perfect situation." - Galen Rupp, now 7 for 7 in championship races in 2009 after winning the USATF 10k title on Thursday night over a tough Dathan Ritzenhein. Rupp's win capped a great win for Alberto Salazar as Salazar's other athlete, Amy Begley, shocked Shalane Flanagan in the 10k. AMY YODER BEGLEY - What a race!!!!!!!!!!!!!! LRC Galen Rupp Wins USATF 10k Title Galen Rupp made it look easy, easily putting away from a surprising Dathan Ritzenhein over the last 500 to win his first USATF title in his last time in the Oregon Duck jersey. Along the way, Rupp dispatched a who's who of American distance running, as veterans Meb Keflezighi and Abdi Abdirahman tried to push Rupp. Rupp's win capped a great day for Alberto Salazar as in the women's 10k final, the Salazar-coached Amy Begley shocked Beijing Olympic medallist Shalane Flanagan in the 10k over the last 150m. *Bolt Plans To Run Hard At Trials It's a scary thought that Bolt, who ran 9.77 the other day, said this: "I am trying to run myself into shape, so I think I will be running the 200m harder." *Webcast for Everything Not On TV Everything good, except for the 5k finals is on TV. LRC's Wejo and Rojo will be broadcasting the 5k finals starting at 10:50 eastern. 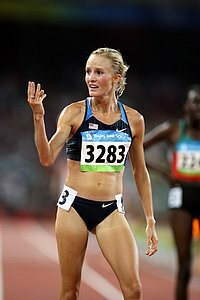 LRC Amy Begley Shocks Shalane Flanagan It came down to a thrilling last lap and in the end it was not the Olympic bronze medallist who came out in top with a Hayward Field record, but the Alberto Salazar-coached Begley. Steeplechase Heats At Kenyan Champs Cancelled Due To Lack Of Water The big action is tonight with the 10ks, which serve as the World Champs qualifiers. All the other events this weekend are not qualifiers for Worlds.